Oxygen is a gas that you cannot see, taste or smell and makes up about 21% of the air around us. Oxygen is necessary for the body and is used by all the main organs and tissues. Medical oxygen is a prescription drug in Canada. Oxygen therapy is prescribed for people with certain lung conditions that prevent the oxygen in the air from efficiently going into their bloodstream. Adding supplemental oxygen ensures that the body can function properly and safely. A person with lung or heart issues may benefit from supplemental oxygen therapy. How does an Oxygen Prescription work? Should you require oxygen, your physician will provide you with a prescription for a flow rate (Litres Per Minute) and the intended use of the oxygen (ie: 24 hours/day). Your oxygen prescription may change over time, so it is important to have your needs reassessed regularly – typically once per year or with any major health changes or hospitalizations. It is important to use your oxygen as prescribed by your physician. Oxygen equipment, including all extension tubing, must be kept at least 10 feet away from open flame. Do not smoke while using oxygen. If you smoke, you must completely remove your oxygen and keep it at least 10 feet away from you while you smoke. Do not allow others to smoke around you. It is important that you let our staff know if you are currently smoking. They will coach you and provide tips on how to use your oxygen safely. Store cylinders away from heat sources and secured so that they cannot fall over. When travelling with cylinders ensure that they are secured in your vehicle and are not rolling around or easily dislodged. Do not attempt to tamper with the equipment in any way. All necessary maintenance will be provided through TrueNorth Respiratory. If your equipment is not working, or is alarming, refer to the information folder given to you by TrueNorth Respiratory - there are several useful troubleshooting guides you can work through on your own. Make sure you are on your back up system while you work through the issues. If you cannot resolve the issues, contact our clinic and our staff will be happy to help you. A Stationary Oxygen Concentrator is a machine that plugs into a regular outlet in your home and concentrates the oxygen from the air around it by filtering out all the other gases in the air. The concentrated oxygen is delivered continuously through lengths of tubing and nasal prongs. This is your main source of oxygen when you are home including while you sleep. 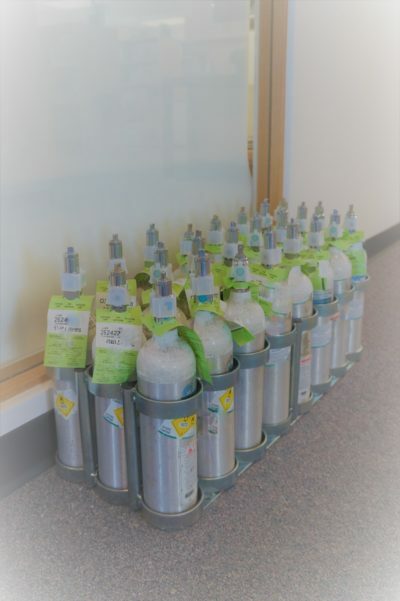 Oxygen cylinders contain compressed oxygen which is accessed through the use of a regulator and nasal prongs. This is a portable system meant for use while away from the home. There are several different sizes of oxygen cylinders and the length of time they last depends on your prescription. Oxygen cylinders are not safe for use while sleeping as they do not alarm once the oxygen in the cylinder has been depleted. 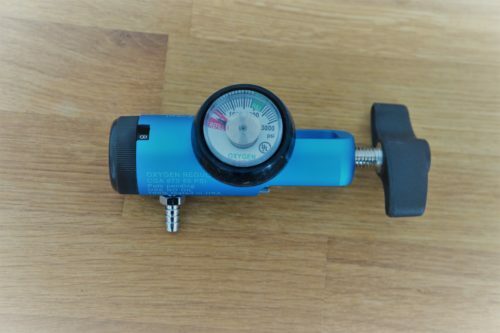 Regulators fit on top of a cylinder and allow access to the compressed oxygen inside. These regulators allow for a continuous flow of oxygen at your prescribed flow rate. Pulse dose regulators are a type of oxygen conserving device. These regulators work by delivering a pulse of oxygen when they sense a breath in (inhalation). No oxygen comes out of the cylinder while you are exhaling, so less oxygen is delivered when you aren’t inhaling. Pulse dose regulators can significantly increase the amount of time a cylinder can last. Not everyone can use pulse dose regulators. 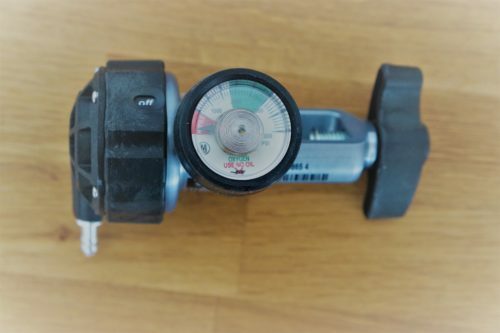 Some people have difficulty “triggering” the regulator, meaning the regulator can’t detect their inhalation and so doesn’t deliver any oxygen. A Portable Oxygen Concentrator (POC) may be suitable for your travel oxygen needs depending on your prescription. POCs are battery operated oxygen concentrators, lightweight, and easy to use. They do not meet all prescription requirements, though, as they are typically pulse dose and limited in the flow rate they can deliver. 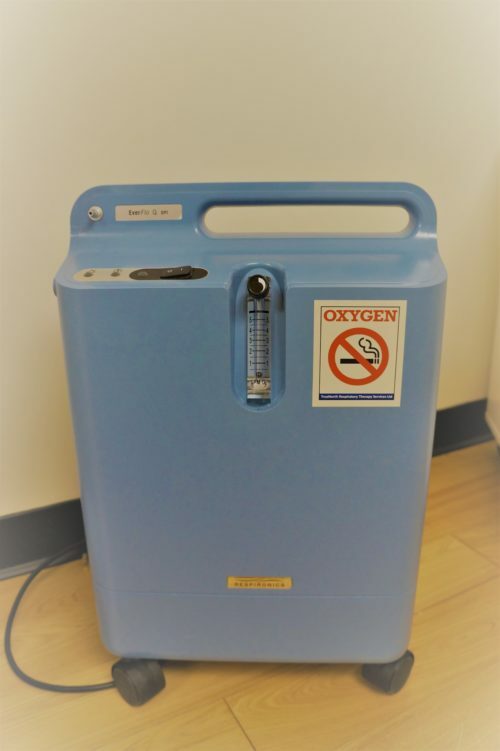 Some portable oxygen concentrators can replace the need of cylinders, regulators and stationary oxygen concentrators in certain circumstances. Traveling by plane with oxygen is possible with planning and advanced notice. Most airlines have specific criteria that must be met in order to fly with oxygen. Each airline is different, though, so please look into your airline's requirements early and involve us in your travel plans as soon as you know you will be traveling. 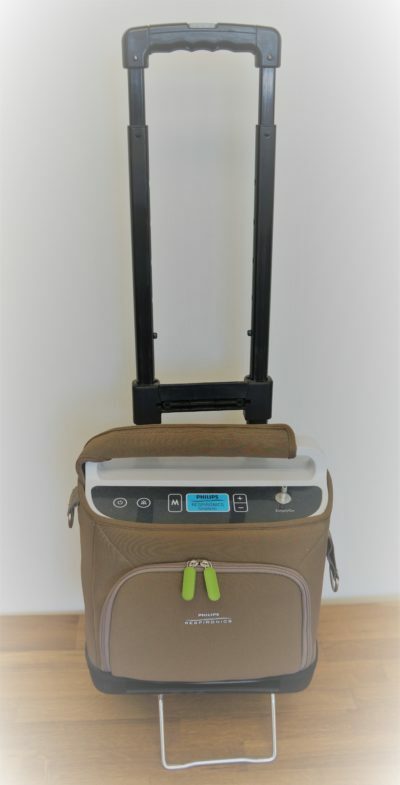 Please print Air North's Portable Oxygen Concentrator Form and have your physician complete it on your behalf. You must present this form to Air North when checking in, and at any time it is requested while traveling with Air North. Please contact our office with any questions or concerns and our staff will be happy to help.